No longer just an in-between meal, brunch has evolved into a trendy lifestyle activity for its biggest fans. And for good reason: brunch means you get the best of breakfast and lunch foods, it’s a prime attraction for mingling with friends and making new ones. Breaking out of the traditional breakfast-lunch-dinner trifecta, brunch has soared in popularity in recent years, and you’ll see why when you pull up a seat at one of these 10 best brunch destinations in South Carolina. Brunch at The Macintosh is everything brunch should be: they feature a tasty offering of shareworthy table-sized dishes like poutine and truffle frites, sweet tooth-satiating sides like funnel cakes and strawberry walnut bread, and dynamic duos like chicken and waffles and steak and eggs. And no brunch experience is complete without a round or two of Bloody Marys or mimosas. The only downside to Fat Hen is that the brunch menu only appears on Sunday. But once you experience the brunchy wonders here, you’ll make a Sunday meal a top priority. They’re dishing up classics like crab soup, fried green tomatoes, and shrimp and grits. Or, to satisfy a more refined palate, you can indulge in the likes of steak tartare, escargot, coq au vin, or braised short rib. This farm-to-table eatery is the local’s favorite for Sunday brunch. Here you’ll find a delicious array of house-smoked salmon boards, shrimp straight from Beaufort, South Carolina, fresh fruit, salads, and Georgetown seafood, all of which are made fresh to order. And don’t forget to indulge in a spiked Arnold Palmer or a bacon-infused Bloody Mary to polish your experience. Roost Restaurant has paired fresh quality with a Sunday brunch buffet experience. 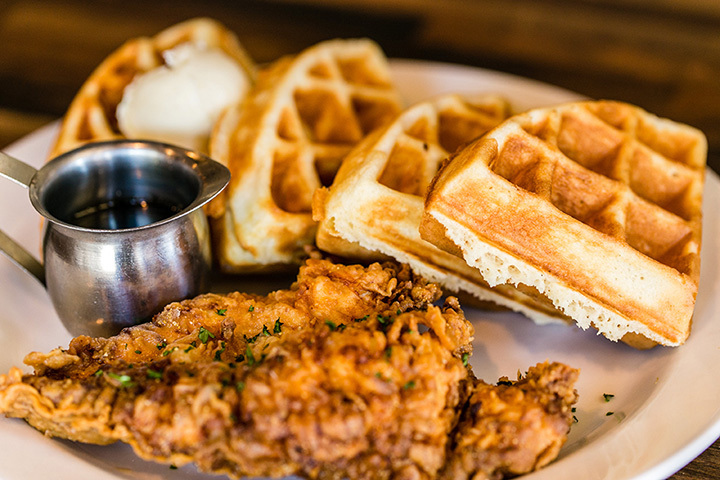 Here you can help yourself to a variety of fried chicken, mashed potatoes, and other brunch options, or you can take advantage of their a la carte menu and order precisely what you’re craving. You also get exclusive access to their Sunday Only cocktail menu. Sunday brunch is a popular attraction in the Upstate, but Earle Street Kitchen & Bar easily stands out as one of the best. Their attention to detail in service and menu items, along with a rustic-type atmosphere has it a favorite among locals and travelers alike. They offer a buffet for Sunday brunchers to ensure you never walk away hungry! Poogan’s Porch has been a pillar of Charleston cuisine since 1976, and it’s easy to see why: Along with their impeccable service, you can expect a menu chock full of tasty, quality savorings that will make you wish every meal could be brunch. Start with some southern favorites like lump crab toast or pimento cheese fritters, then fill up on popular dishes like shrimp and grits or the Lowcountry omelet. Located inside the prestigious Willcox Hotel, visitors don’t need a reservation to enjoy Sunday brunch here. The options here align more with lighter fare options, such as tomato and cucumber salad or sweet corn and crab soup. You can also find several classics-with-a-twist, such as the coconut pancakes or cheddar jalapeno sausage that are sure to become your new favorites. French inspiration bursts from every brunch dish served at Manuel’s Bread Cafe. You can enjoy fare ranging from light to filling every Sunday, including cheese plates, salmon, a variety of egg creations, and fresh produce straight from the chef’s own farm. And their sparkling Mangosa is not to be missed. Fresh, trendy, and miles from ordinary, you’ll want to make Sunday brunch at The Mustard Seed a long-standing weekly tradition. Diners can indulge in unique dishes like shrimp omelets and citrus vodka-cured salmon, along with southern classics like shrimp and grits and steak and eggs. And don’t forget to try their signature mustard seed hash browns—they’re sure to “grow” on you. Who says brunch should be reserved for Sundays only? Rustic Table sought to change that by extending their brunch menu into Saturdays, too. And it’s a good thing, too: you’ve never seen such a well-rounded brunch menu like this one, and you’ll want to come back often to try everything on it. You can choose from staples like she crab soup or the wedge salad, or go bold with popcorn gator, fried beets, oyster sliders, or warm brie & pear honey.